SAN FRANCISCO CALIFORNIA Vending Machine Service Companies. 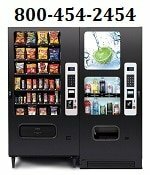 (Northern California areas) Offering FREE Vending Machines: Snack, Soda, Drinks Combo, Food, Frozen, Ice Cream, Water, Healthy, Micro Markets, Coin-op Amusement Games, Repair Services and more! Bay Area Vending offer a wide variety of vending options to cater to your companies needs! We have traditional vending programs that can accommodate small to large companies and we also have the flexibility to offer free and subsidized programs. What ever your vending needs are, we can custom design a program to meet those needs.